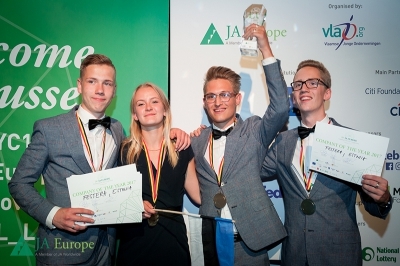 Over 200 students gathered in Brussels to celebrate the top JA companies from across Europe. This year, 37 student-teams competed as part of JA Europe’s flagship JA Company Programme, which gives them the opportunity to set up and run a real business. His Majesty the King of the Belgians, EU Commissioners Marianne Thyssen and Tibor Navracsics, Belgian Ministers Alexander De Croo and Willy Borsus, as well as foreign dignitaries and various business volunteers were among those who attended the stand exhibition of the student companies, all keen to show their support. Participants of the European Entrepreneurship Education Summit also came to see the students in action, both events being held simultaneously in Brussels, seat of the European Institutions. Estonia’s contestants Festera scooped the main award of the JA Europe Company of the Year Competition 2017. This award - presented before 700 people at the Gala Award Ceremony - honours the student company that demonstrates the best approach to communication, teamwork, problem-solving, objective-setting, personnel management, product development, customer focus, marketing and financial results. Festera showcased an innovative business concept with a strong environmental angle that particularily impressed the jury. Their creation, the Festera biobox, is an indoor trash can that recycles organic waste. It can turn a household’s entire food waste output into humus in less than two months, thereby reducing a family’s ecological footprint by more than 5 percent. “We’re thrilled to have won this European competition. We knew that we’d done our best, but there were so many good companies participating. What we learned from this experience is that you need to keep on going, even if nobody believes in your project. That’s how you succeed” shared Festera team members. “They were overwhelming in all the criteria we assessed. If you look at their learning curve from the very beginning all the way to their future plans, it’s impressive. They’ve been so persistent, having had to overcome so many obstacles, difficulties finding partners and having their own faith tested, they continued to go for it. What they have done from a learning perspective is exemplary!“ shared Chair Judge Nikolaas Tahon, Managing Partner at Deloitte Accountancy . “This is where it is possible to truly see the R.O.I of entrepreneurship education. This is the “final exam” for competence, motivation and confidence. But it’s also where we see the impact of the learning environment on teachers, on mentors and on parents” said Caroline Jenner, CEO of JA Europe. Last school year, the JA Company Programme counted over 300 000 participating students across 40 countries in Europe. Through the process of learning to run a company from top to bottom, JA Company Programme students create and market real products and services. The success of the programme is largely down to the wide support from business volunteers, acting as mentors, offering expert advice to the students. Partnerships between education and business are essential to closing the gap between classroom theory and real-world challenges. European Commissioner for Employment, Social Affairs, Skills and Labour Mobility. European Commissioner for Education, Culture, Youth and Sport. Deputy prime Minister of Belgium and Minister of Development Cooperation, Digital Agenda,Telecom and Postal Service. AT&T Excellence in IT Award recognises the student-company showing the best innovation-driven concept, strong business potential, sustainability, viability and scalability. Citi Client Focus Award recognises the student-company that excels at creating value for its clients by listening to them and putting themselves in their place so as better to anticipate and serve their needs. Facebook Best Social Media Marketing Campaign Award recognises outstanding work across social media platforms, celebrating creativity, innovation and connecting people to your business. FedEx Access Award recognizes student-run businesses that best exhibit the principles of global connectivity. The ManpowerGroup "Ready for Work" Award recognizes those teams that have the best-built work readiness skills during the competition. This year, ManpowerGroup presented the award for the project with the most significant impact on developing learnability, a key component of work readiness. MetLife LifeChanger Award recognizes the student-company which best grasps the concepts of social impact, financial performance and innovation in their business strategy while remaining a realistic plan in today's marketplace. The Euroclear Social Entrepreneurship Award aims to award the team best exemplifying the idea of a company that makes a profit while also contributing to the greater good of society. The Alumni Leadership Award supported by AXA was presented to individuals demonstrating outstanding leadership skills impacting their team and the JA company. With this award, JA Alumni Europe wishes to recognise and honour the personal strength of the individuals in a successful team. JA Europe is Europe’s largest provider of entrepreneurship education programmes, reaching 3.5 million students in 40 countries. JA Europe brings the public and private sectors together to provide primary and secondary school students and university undergraduates with high-quality education programmes teaching them about enterprise, entrepreneurship, business and economics in a practical way.